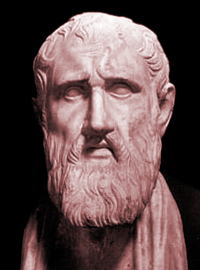 Zeno of Citium was a Hellenistic philosopher born in the 3rd century BC in the town of Citium, a Greek colony on the island of Cyprus which also had a large Phoenician population; Zeno himself may well have been of Phoenician ancestry. None of his writings survive and what is known of his life and his works come down to us through the accounts of others. The major source being Diogenes Laërtius who wrote "The Lives and Opinions of Eminent Philosophers" in the 3rd century B.C. This is a compilation of facts, myths, rumors and excerpts from other writers and contemporaries concerning the life and work of Zeno. The son of a merchant and a merchant himself, it is said he was exposed to philosophy later in life after a shipwreck off the coast of Attica deposited him in Greece and from there he made his way to Athens. It is also suggested that he was not shipwrecked at all but that he may already have been a student of philosophy. His father was a merchant who had travel to Greece and may have returned with works for his son to study, that on a trade mission to Greece, he simply sold all his cargo at Athens and decided to stay to continue his study of philosophy. Regardless of how he came to Athens, while there he met the Cynic philosopher Crates who would become his first instructor. he would eventually study under other teachers of the time such as Stilpon, Xenocrates and Polemon until he founded his own school, the Stoa Poikile, around 300 B.C. His school was named for his teaching platform, located on the north side of the Ancient Agora of Athens, the Painted Porch ("stoa" is Greek for "porch"). Laërtius states that he came to Athens when he was twenty-two years and Apollonius says that he presided over his school for forty-eight years. His teachings were the beginning of Stoicism which was partly based on ideas taught to him by Crates and other Cynic philosophers whose founding father, Antisthenes, had been a disciple of Socrates. Zeno preached that "man conquers the world by conquering himself." He lectured his students on the value of apatheia, which he explained to be the absence of passion. Only by controlling one's emotion and physical desire, he argued, could we develop wisdom. Central to his teachings was the law of morality being the same as nature. Zeno often challenged prohibitions, traditions, and customs and emphasized love for all other beings. Stoicism was the first philosophical school of thought to morally condemn slavery. He developed the concept of Kathekon meaning befitting or appropriate actions and states that one must always act in accordance with Nature. Zeno's most influential follower was Chrysippus who further developed and taught Stoicism which would later be adopted by thinkers such as Cicero, Seneca the Younger, Marcus Aurelius, Cato the Younger, Dio Chrysostom, and Epictetus. Other philosophers who succeeded Zeno as leaders of the Stoa were Cleanthes, Zeno of Tarsus, Diogenes the Babylonian, Panaetius of Rhodes, Posidonius, and Hecaton. As he left the school, he tripped, fell and broke a toe. Hitting the ground with his hand, he cited words of Niobe: "I am coming, why do you call me thus?" Since the Stoic sage was expected to always do what was appropriate (kathekon) and Zeno was very old at the time, he felt it appropriate to die and consequently strangled himself. Zeno himself never denied that he was a native of Cittium. For that when on one occasion, there was a citizen of that town who had contributed to the building of some baths, and was having his name engraved on the pillar, as the countryman of Zeno the philosopher, he bade them add, "Of Cittium." he was thin, very tall, of a dark complexion; in reference to which some one once called him an Egyptian. Of his disposition and way of life it is reported: For in reality he did surpass all men in this description of virtue, and in dignity of demeanor, and, by Jove, in happiness. He was a person of great powers of abstinence and endurance; and of very simple habits, living on food which required no fire to dress it, and wearing a thin cloak. there were also a lot of dirty beggars always about him writing: Till he collected a vast cloud of beggars, Who were of all men in the world the poorest, and the most worthless citizens of Athens. And he himself was a man of a morose and bitter countenance, with a constantly frowning expression. He was very economical, and descended even to the meanness of the barbarians, under the pretence of economy. He is reported to be the author of the following works —The Republic, A treatise on a life according to nature, one on Appetite, on the Nature of Man; on Passions, on Duty, on Law; on the usual Education of the Greeks, on Sight, on the Whole, on Signs, on the Doctrines of the Pythagoreans, on Things in General, on Styles, five essays on Problems relating to Homer, one on the reading of the Poets. There was also an essay on Art, and two books of Solutions and Refutations, Reminiscences, and one called the Ethics of Crates. "Fate is the endless chain of causation, whereby things are; the reason or formula by which the world goes on." "No evil is honorable: but death is honorable; therefore death is not evil." "We have two ears and one mouth, so we should listen more than we say." "tranquility can best be reached through indifference to pleasure and pain"
Cyprus is the third-largest island in the Mediterranean which lies off the southern coast of Turkey and the western shore of Syria. The island has been inhabited for more than 12,000 years, first by prehistoric hunter-gathers, later by small farming villages until Mycenaean, Greek and Phoenician culture is believed to arrive in the bronze age around 1600 BC. Soon after the island inhabitants came into contact, and began trade with, Egypt. In the 6th century Cyprus was conquered by Amass of Egypt until Cambyses conquered Egypt and it fell into the hands of the Persians. Alexander the great claimed the island for the the Macedonians and then the Ptolemies of Egypt controlled it for a time until Rome annexed it in 58-57 BC. It then became a part of the Byzantine empire in 395 which would rule the island for more than 800 years until King Richard I of England captured the island in 1191 during the Third Crusade. In 1192, the French knight Guy of Lusignan purchased the island, in compensation for the loss of his kingdom, from the Templars. The Republic of Venice took control in 1489 until it was conquered by the Ottoman Turks under the command of Lala Kara Mustafa Pasha in 1570 who sacked its palaces, public buildings and churches and massacred more than 20,000 Nicosian Greeks. Under Ottoman rule the island saw its first major influx of of turkish immigration to the island as those who moved there and stayed were rewarded with money and land. Greek Christians were allowed their own communities but forced to pay steep taxes to Ottoman rulers giving rise to opposition and bloody uprisings. By 1760 the situation in Cyprus was intolerable for both Turk residents and Greek alike. In addition to heavy tax burdens a terrible epidemic of plague, bad crops and earthquakes drove many to leave the island. Cyprus was placed under British control in 1878 as a result of the Cyprus Convention, which granted control of the island to Britain in return for British support of the Ottoman Empire in the Russian-Turkish War. Cyprus was formally annexed by the United Kingdom in 1913 since Turkey had joined the Central Powers. Many Cypriots signed up to fight in the British Army in both World Wars with the promise that when the war finished Cyprus would be united with Greece. The British balked at giving Cyprus its independence spawning resistance and opposition movements until, after seemingly endless posturing and debate, Cyprus was declared an independent state on August 16, 1960 with Archbishop Makarios as it president. The terms of its independences and the two ethnic communities at odds with each other made a peaceful workable government all but impossible. Tensions rose and the populations segregated. Greek citizens looked to unify with Greece, Turkish residence looked to unify with Turkey. 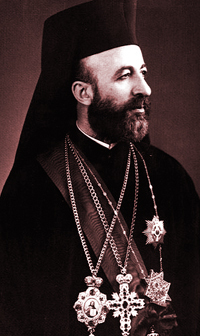 Animosity grew and the island fractured culminating in a Greek led coup d'etat and Archbishop Makarios was overthrown in a military coup led by the Cypriot National Guard. Soon after Turkey invaded Cyprus claiming it was asserting its right to protect the Turkish Cypriot minority. Turkey gained control of 30% of northern Cyprus and displaced some 180,000 Greek Cypriots. Talks in Geneva involving Greece, Turkey, the United Kingdom and the two Cypriot factions stalled and Turkish forces continue its military actions on the island. 200,000 Greek Cypriots were displaced from their home land and as reprisal, the entire Turkish Cypriot male population of Tokhni was massacred by Greek Cypriot paramilitaries. A UN-sponsored cease-fire was established on July 22, and Turkish troops were permitted to remain in the north. In December of 1974, Makarios again assumed the presidency. The following year, the island was partitioned into Greek and Turkish territories separated by a UN-occupied buffer zone. The events of the summer of 1974 have dominated Cypriot politics ever since and have been a major point of contention between Greek and Turkish Cypriots, as well as the countries of Greece and Turkey. Turkish Cypriots proclaimed a separate state under Rauf Denktash in the northern part of the island on Nov. 15, 1983, naming it the “Turkish Republic of Northern Cyprus.” The UN Security Council declared this action illegal and called for withdrawal. No country except Turkey has recognized this entity. In May 2004 Cyprus was admitted into the European Union and Turkish Cyprus elected pro-reunification leader Mehmet Ali Talat as their president, ousting longtime leader Rauf Denktash, who staunchly opposed reunification which lends hope to future unification. In 2005, Turkish Cypriots demolished the part of the wall along the boundary that for decades has split its capital and in March 2007, Greek Cypriots demolished the part of the wall on the Greek side. Cyprus is well known as the island of Aphrodite, the goddess of love and beauty, who, according to legend, was born there. Throughout ancient history, Cyprus was a flourishing centre for the cultic worship of Aphrodite.